Since GMHC’s founding in 1970, more than 1,400 homes have been built or renovated for subsequent sale, and nearly 100,000 families have received counseling, assistance and practical help in finding affordable housing and in making their current home safer, more livable and comfortable. In addition, hundreds of jobs have been created to support the construction and renovation of affordable housing units throughout the greater Twin Cities metropolitan area. A once-homeless individual now loves her home. As an educational assistant in the Minneapolis Public Schools, Ann Marie Cosgrove sees first hand, on a daily basis, the stress and difficulties that low and moderate income families experience in securing affordable housing. Once homeless herself, Ann Marie has worked hard to become a homeowner, a public speaker on behalf of a nonprofit organization she founded, and an advocate of GMHC’s HousingResource Centers. She has owned her home, built in 1911, since 1996 and found the support, resources and expertise she needed at a GMHC HousingResource Center. The staff was awesome and really helpful in many ways. They guided me through the process of getting needed work done and encouraged me so much, she said.Ann Marie had lead abatement work done, a new sidewalk and new windows installed. 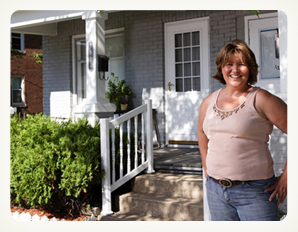 As a now happy homeowner, Ann Marie can focus on her occupation and her nonprofit organization without worrying about home repairs. She has a sanctuary to return to every night. This GMHC contractor expanded his business and secured his future. Growing up on Minneapolis’ Northside, Henry Ford learned carpentry, home repair and maintenance skills from his father, who owned and managed rental properties. At an early age, Henry learned how to use tools, how to paint; and how to pay attention to the details that make an affordable home comfortable and attractive. 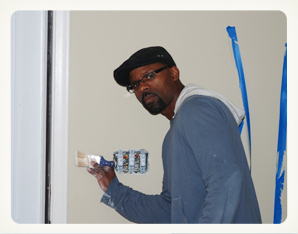 So it was natural for Henry, when he reached adulthood, to apply his talents to his own business of remodeling and rehabilitating distressed homes in North Minneapolis. He bought them, lived in them and brought them up to livable condition for later sale and occupancy by grateful residents. In 2007, as the housing market was faltering, Henry found himself with very few options to continue his passion for restoring homes as a vocation. Fortunately, he connected with GMHC, which aided him in developing a competitive bidding process that enabled him to successfully win his first construction project with GMHC. His work on that initial project led to other contracts and he is now successfully working on one GMHC project after another. It’s been so good for me to be working with GMHC, Henry says. They always help me keep on track with what’s important, they pay quickly, they are clear in what they expect of me and are helpful to me in so many ways. Today Henry has found a reliable source for his own livelihood, but also employs others in his projects for GMHC; he’s helping others gain experience and a trade, and contributing to the health and vitality of the neighborhoods in which he works. Henry Ford is a success story made possible by the programs, personnel and priorities of the Greater Metropolitan Housing Corporation. This couple now owns their own home, with GMHC’s help and assistance. As long-term occupants of rental properties, Laura Fritz and Aaron Lockridge were comfortable in their rented duplex in South Minneapolis. They had no active plans for home ownership. That is, until a family friend and realtor with ties to the Greater Metropolitan Housing Corporation (GMHC) suggested they consider home ownership and arranged the viewing of a South Minneapolis single-family home that GMHC had purchased and completely refurbished for its next owners. 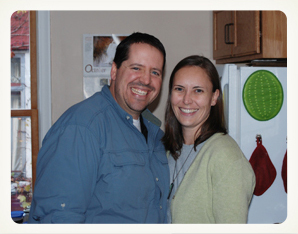 With a new furnace and air conditioning, new windows, carpeting, appliances and a replastered, repainted, refreshed and refurbished interior, Laura and Aaron saw a positive opportunity for home ownership. We thought about it quite carefully, said Laura, then decided to take the step of owning our own home. Once their offer was accepted, the couple quickly became enamored of their new prospective neighborhood. We would walk through the neighborhood, meeting residents, asking question and getting to know our new neighbors, said Aaron. Coming up to the closing, GMHC couldn’t have been more helpful. We had no idea what to expect. But they were patient, knowledgeable and helpful at every turn. They directed and enabled us to secure financing assistance through the City of Minneapolis, we attended homeownership classes; they provided great assistance in every step of the process. We are so thankful for what GMHC did for us, said Laura. It seemed overwhelming, but GMHC made it easy. Aaron agreed, Everybody we dealt with at GMHC was stellar. And now we are experiencing the great satisfaction of ownership. We feel connected to the neighborhood; we care about what happens here, we are committed and invested here and want to become as much a fixture in this neighborhood as our home is. Bringing restored vitality and a renewed sense of community to each neighborhood and each family is a hallmark of GMHC’s contribution to the well-being of the Twin Cities metropolitan area.